Last Saturday, Friends of the Island Fox and Channel Islands Restoration (a native plant restoration group) partnered up to remove invasive plants on Santa Cruz Island. 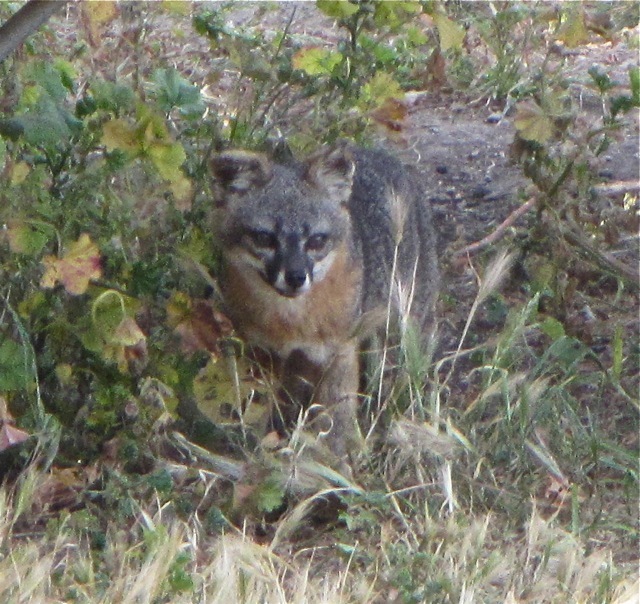 Island foxes depend on a healthy native plant community for food and shelter. To survive, they have evolved to be highly omnivorous–eating a range of native fruit, insects, and other small prey. The island deer mouse may be food for the island fox, but in turn it depends on seeds from buckwheat, giant coreopsis, and other native island plants. 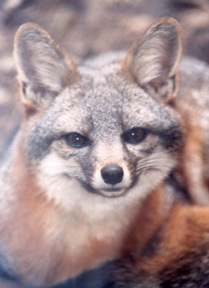 Island foxes are directly and indirectly impacted when the native plant community is compromised. Introduced species like this oyster plant (Tragopogon) can quickly invade hillsides pushing out native plants. Though the dandelion-like globe of seeds may look beautiful in the sunlight, it does not provide food or shelter for island wildlife and it is about to spread seed far and wide with the next good breeze. On a mission to help restore the island's natural habitat and with grant support from LUSH Cosmetics, volunteers headed out to make a positive difference. 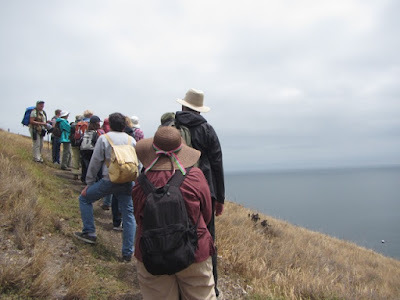 We learned about native plants on a hike to Cavern Point, then snipped our way through a quarter-mile section of Scorpion Canyon. We filled trash bags with the seed heads, to decrease the invasive plant's reproduction this spring/summer. 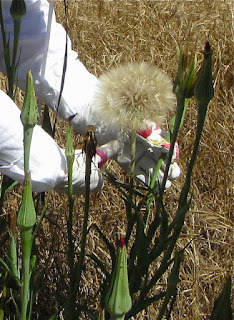 It was amazing how heavy just the seed heads were as we filled our bags. 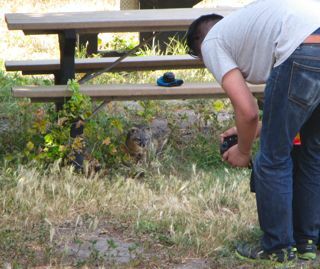 And of course, we were thanked by visits from several island foxes during the course of the day. Smiling faces and black bags filled with invasive-plant seed heads being removed from the Channel Island ecosystem. It feels good to make a positive difference. 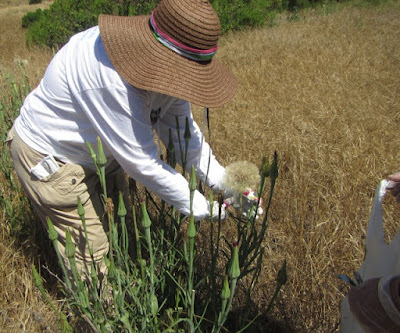 If you're interested in participating in a plant restoration trip send us an e-mail at islandfoxnews@gmail.com. We hope to go out on a second trip sometime this year. Thanks to a great day of team work! More bags behind us! What's so special about this trash bin? As Channel Island foxes recovered on Santa Catalina Island, their growing numbers brought a new challenge. Old and open trash cans were posing a double threat to fox survival. Island foxes attracted to available trash were being hit by cars on their way to trash cans and also becoming trapped inside, sometimes with lethal consequences. The solution was "Fox-Saver" bins, sealed receptacles built to only be opened by human hands. 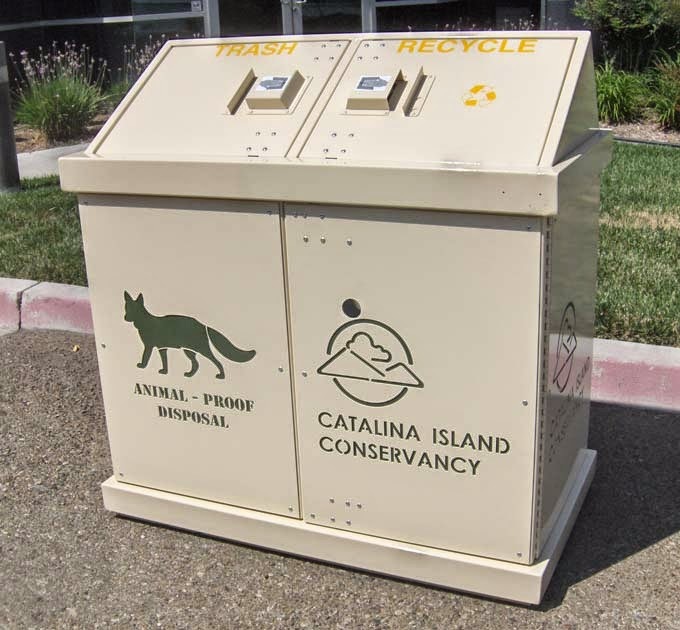 In 2015, Friends of the Island Fox donors raised $6,000 to fund three of these special trash bins. One student created an entire T-shirt campaign to support the effort and raised nearly $1,000. The trash bins have been install just in time for the summer season, when Catalina's parks and open areas are visited by over a million tourists. 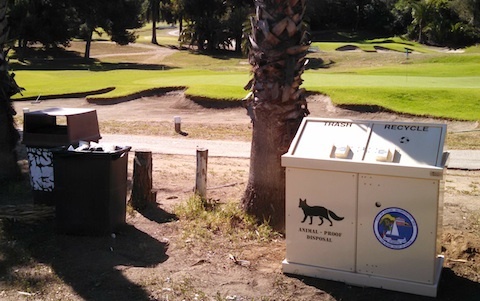 This "Fox-Saver" bin has been placed in Bird Park (one of the locations which had claimed the most island fox lives). You can see the two open trash cans that were then removed, on the left side of the photo. 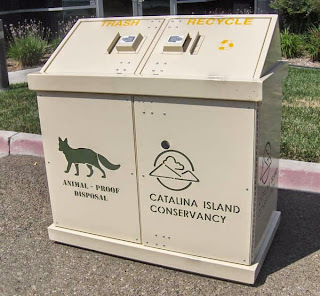 The two additional "Fox-Saver" bins, plus a fourth sponsored by island efforts, have also been put in place in the park, ready to secure trash and protect island foxes. This was a joint effort of island fox supporters of all ages from across the country. Protecting this rare species requires all of us working together. 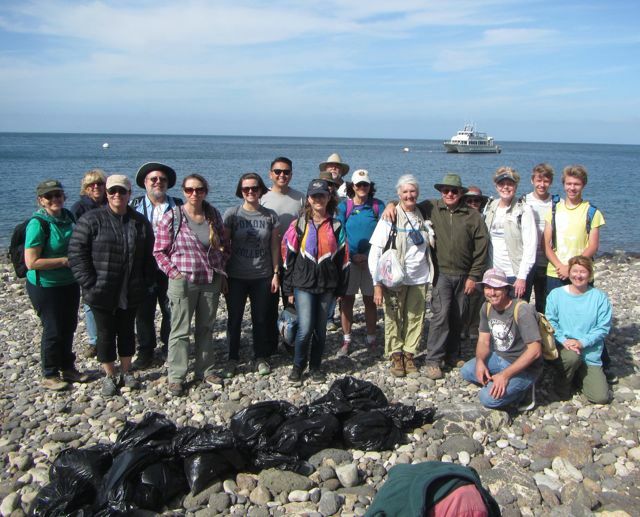 If you visit Catalina this summer, take a look at the positive change that can be accomplished with group effort. 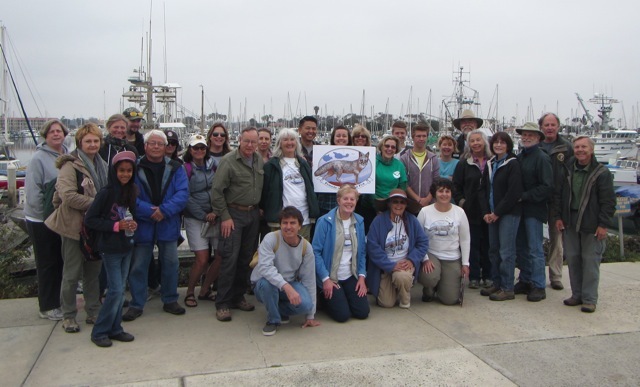 Thank You to our friends at the Catalina Island Conservancy, the Island Company, the City of Avalon, and everyone helping make Catalina a safer home for island foxes. 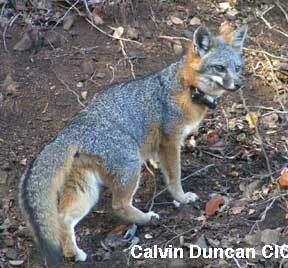 Why were Catalina's island foxes faced with near extinction?